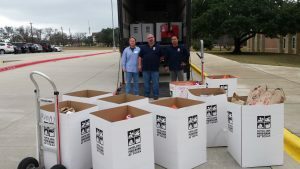 ZumaOffice.com is again working with students and faculty at Vandegrift High School and Four Points Middle School for the 5th Annual Central Texas Food Bank Food Drive. Non-perishable food items are being collected now at both schools for hungry families in need, and we look forward to another record year of donations. The food drive started as an idea of VHS boy’s basketball coach Cliff Ellis and Greg Pierce of Zuma Office as a way for the basketball team to give back to the community. That first year, four of the large Central Texas Food Bank donation boxes were filled and a holiday community service tradition was begun. The Central Texas Food Bank Food Drive has raised over 8300 lbs of food! It has mushroomed to include nearby Four Points Middle School, the VHS Honor Society, Student Council and UNICEF, and has now collected over 8,300 pounds of food for hungry central Texans in need for the holidays. Last year’s results were 17 donation boxes showing the incredible generosity of area students and families! If you’re out around VHS or FPMS before the schools close for the holidays, take by some canned goods and help feed the hungry this holiday season. Zuma is honored to work with these awesome schools and the Central Texas Food Bank! This entry was posted in Office Supplies and Charities and tagged Central Texas Food Bank, Giving Back, office supplies, Zuma, Zuma Charity Support. Bookmark the permalink.